A new report released in Europe links hip fractures to a class of drugs that includes Fosamax. The class of drugs is known as bisphosphonates. Fosamax is the most popular member of that class of medications. Bisphosphonates are drugs that are prescribed for patients who want to prevent the development of osteoporosis. The ironic aspect of the conclusion drawn by this report is that Fosamax is supposed to strengthen bones, thereby reducing the risk of osteoporosis. Fosamax is manufactured by Merck. This study only adds to the growing body of data that links the use of Fosamax with the increased risk of hip fractures. The report, a link to which can be found here, is a doctoral thesis that was completed by a researcher at the University of Navarre. The thesis concludes after reviewing data from Europe that not only did the use of bisphosphonates not reduce the risk of older women, who typically use these medications, of suffering from hip fractures, but using these drugs actually showed an increased risk of this injury. An increased risk of hip fractures is a relatively new potential problem with drugs such as Fosamax. Previously, one of the most commonly alleged Fosamax side effects was an increased risk of suffering from fractures of the femur, which is a bone in the leg. 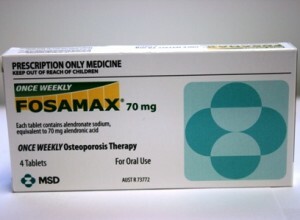 As mentioned above, Fosamax is manufactured by Merck, one of the titans of the pharmaceutical industry. The drug was introduced to the market in 1995. Given its early entry onto the market and its length of availability, Fosamax generated an enormous amount of revenue for Merck over the years. At its height during the early years of the 21st century, Fosamax accounted for billions of dollars in sales for Merck on an annual basis. In recent years, generic medications have become available and the revenue numbers for Merck related to Fosamax have fallen. However, since the biggest risks associated with Fosamax deal with its long-term use, there are many people who may have already suffered and who may continue to suffer harm as a result of this medication. Given the problems associated with Fosamax as alleged by people all over the United States, thousands of Fosamax lawsuits have been filed by American consumers against Merck. In 2013, Merck agreed to pay nearly $30 million to consumers in order to settle more than 1,100 lawsuits that were filed because consumers alleged that they suffered osteonecrosis of the jaw. With the release of this new information, it’s possible that additional Fosamax lawsuits could be filed by injured consumers. If you or someone you love has used Fosamax and been injured as a result, you need to take action to protect your legal rights. You should do so with the help of Fosamax side effects lawyers who understand what it takes to hold large corporations accountable. Contact Parilman & Associates today to schedule a free initial consultation. You can either email the firm or call 800-800-DRUG.